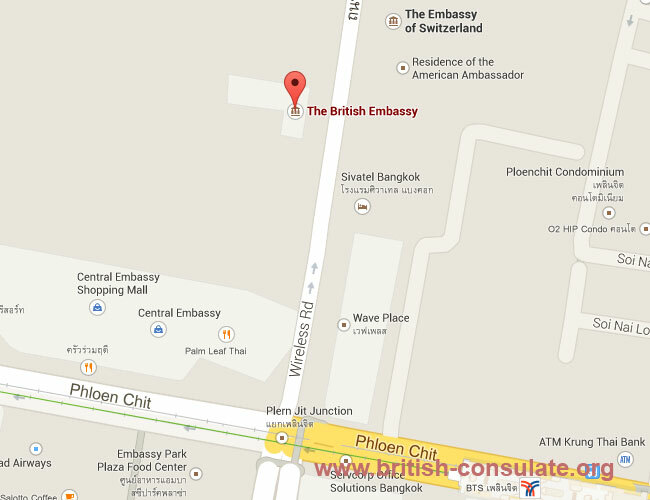 The British Embassy in Thailand is located in Wireless Road in Bangkok close to the US Embassy. Expats in Thailand can apply at the British embassy for a birth registration if they have a child born in Thailand. The embassy also offers consular services such as death registrations and can also assist with certification of documents. The Embassy in Bangkok can issue a British spouse visa, fiancee visa or a visitors visa to Thai nationals however this is done via a third party. The contact details such as the address and telephone number has been listed below. We also added a map so you may find the embassy in Wireless road easier. They can also add pages to your passport on the same day. Speak to the staff at the embassy about your options. Also note that the British Embassy in Bangkok cannot assist you with a marriage visa for Thailand however they can issue you with a letter of no impediment if you are getting married. They can also issue you with a letter of income for your retirement visa if you have a government pension. See more details about consular assistance such as passport applications, registration of births and also on affirmations as well as document certifications. These are the contact details for law firms in Thailand. Note: The British Consulate in Chiang Mai has closed.